city of Tagbilaran. The said old building is the RARA Vocational School and is almost as old as UB's old building (now used by the high school day and night classes). According to an unofficial report from the city fire marshall, the fire originated at the ground floor of the two-storey RARA building occupied by a dress shop and the Sto. Ni�o Learning Institute (formerly MAJ computech, a computer store). Faulty electrical wiring is the possible cause according to the fire investigator. The fire quickly swallowed the RARA building which is made of light wood materials. The Tagbilaran DILG firefighters were not able to stop the fire from immediately spreading to the UB high school building because this high school building too is made from light wood materials. In about an hour and a half, the fire engulfed about 40% of the UB building. Firetrucks from two big business establishments of the city, namely the Alturas Group of Companies and the Bohol Quality Corporation together with firefighting units from other towns of Bohol helped in combating the fire. At about 4:00 A.M., the fire was said to be contained but not yet completely put out. The neighborhood wherein UB is located is situated in a block comprising of many small business establishments, boarding houses, residential houses and a gasoline station. The direction of the breeze was from the RARA building towards the quadrangle of UB. Because of the combined efforts of the different firefighting units, the fire only burned the RARA building, part of the entire UB building and very few of the boarding houses. It swept literally across UB's old building all the way to the old main entrance along Palma street. According to a live interview with the president of the university, former Gov. 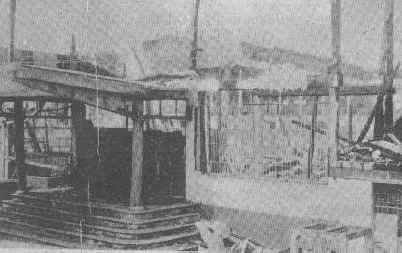 David B. Tirol, by no less than DYRD's station manager who actually was on the scene during the incident, the fire caused an estimated damaged of about thirty to fourty million pesos. The areas affected by the fire inside the university are the following; the entire High School Building, the Engineering Building, the Teachers College Building, Architecture, Liberal Arts, Criminology, College of Law and V.T. Advance Learning. He also said that the school is fully covered by an insurance policy and that they will immediately prepare the necessary documents for their insurance claim inorder to waste no time for the recovery of the school. He assured the students that classes will resume after a few days despite the calamity. UB Alumni members are encouraged to inform their fellow members about this sad incident. You may post your message at WebLine Bohol Forum under the category SCHOOL for other alumni members to read or you may send email to webline_bohol@iname.com for your message to be posted on WebLine Bohol Community Billboard. Photos of the UB conflagration will be posted on this page as soon as they are available.